Our Sept WiN meeting is yes... this Thursday! Please let me know if you will be attending. 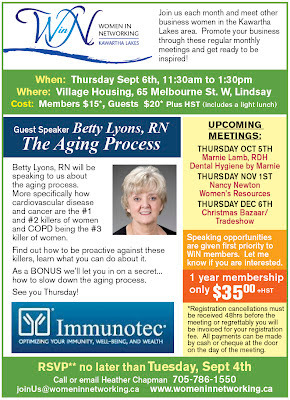 Betty Lyons, RN will be our guest speaker, talking about the #1, #2 and #3 killers for women and what we can do about it. Fill details below. Also, if you have any gold you would like to trade in for cash I will be available immediately following the meeting. Please let me know if you are interested.